In a ceremony at Tokua Airport last Friday( 28th October), Air Niugini named one of its Fokker 100 aircraft “Rabaul”, coinciding with the airline’s 43rd anniversary celebrations staged in Kokopo over the weekend. This is the second F100 aircraft to be named, after another was named “ City of Lae” some time ago. 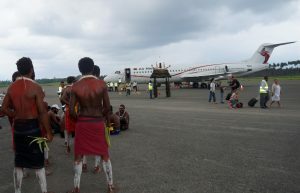 Air Niugini has previously also named three of its Fokker 70 aircraft “Mt Hagen”, “Hoskins” and “Alotau”. 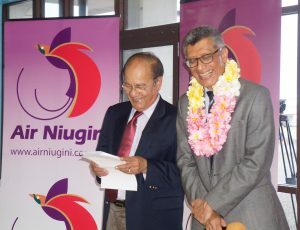 Air Niugini Board Chairman Sir Frederick Reiher, during his address at the naming ceremony, said the name Rabaul is in recognition of the significant contribution made by East New Britain towards the airline’s domestic routes. 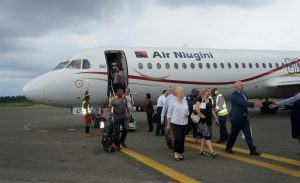 Air Niugini currently operates 40 flights a week between Rabaul and Port Moresby, Kavieng, Buka, Kieta and Lihir, and this will rise to 48 flights from December this year when the airline reintroduces direct flights from Rabaul to Hoskins and Lae with the F70 jet. 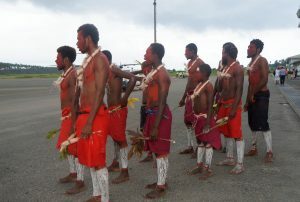 Sir Frederick also said East New Britain, and its capital Rabaul, have been nominated by the National Government under its four pillars of national economic development plan as the tourism hub for the country, hence it is only fitting to have the provincial capital’s name one of its aircraft. 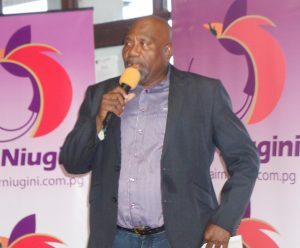 The chairman of the Air Niugini Board added that the airline’s wholly owned subsidiary, Link PNG, is planning new services between Rabaul and Jacquinot Bay in 2017. 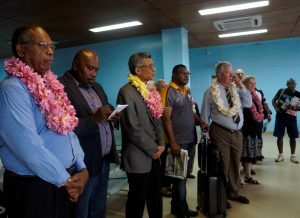 “ I am pleased to note that the National Airports Corporation(NAC) and the ENBP Government have signed an MOU for the provision of technical advice which will be followed by a tender for the necessary airstrip upgrading.” Sir Frederick said. 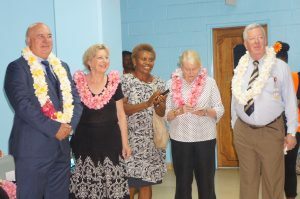 Sir Frederick said as Air Niugini builds the volume of connecting passengers between Rabaul through Port Moresby and its many international destinations, this will in time allow markets to develop sufficiently for direct international flights from Rabaul to become viable in the future. 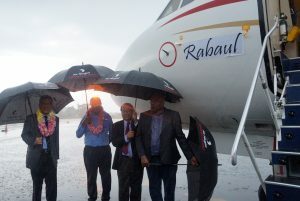 Sir Frederick, Air Niugini CEO Mr Simon Foo, Rabaul MP Dr Allan Marat and ENB Governor , Mr Ereman ToBaining Jnr carried out the unveiling during a heavy downpour to christen the aircraft “Rabaul”.